Mr Usamate said the development signifies another achievement of Government’s commitment to ensure that all Fijians were accessible to electricity. 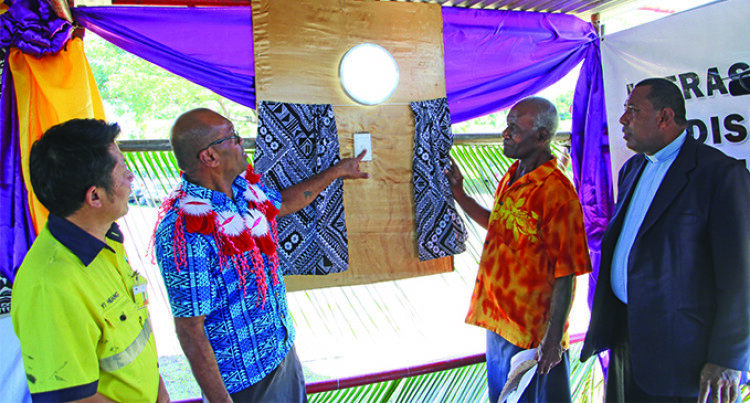 An electrification project that will benefit 53 households at the low-cost housing community in Vatukoula was commissioned on Friday. The Minister for Infrastructure, Transport, Disaster Management and Meteorological Services, Jone Usamate said, the Government spent $544,442 on the development which includes grid extension and house wiring projects. It will benefit about 265 individuals. “We believe that the provision of necessary infrastructure such as electricity, water, roads, jetties will enable ordinary Fijians to realise their full potential and contribute to the development of this nation,” he said. “Affordable and reliable electricity supply can be life-changing and create new opportunities. “The positive impacts from this infrastructure development will provide a step up in life and enable you to achieve greater things for your families and for Fiji. Mr Usamate told the residents that being connected to the grid meant their economic prospects were brighter. He told them that it was up to them to maximise on the opportunity. “Access to power is an enormous advantage, it allows you to become more productive and accomplish far more on a daily basis. Mr Usamate also thanked the Vatukoula Gold Mine management for their consent towards the extension of the grid on the company land. He thanked the company for providing electricity supply to the respective communities since the establishment of the company. Also, he thanked Energy Fiji Limited, its chairman, the board, management and staff for making the project possible.